“President Obama, are you shocked at the possibility of spying on a political campaign in post-Watergate America?” “President Obama, are you supportive of Attorney General Barr’s efforts to fully investigate the reasons for this spying?” “President Obama, if FISA courts were deceived in any way by your FBI, would you characterize that as a scandal — and, if not, how would you characterize it?” “President Obama, when you said that you learned about Hillary Clinton’s secret email server by reading about it in the papers, were you being honest, sir? Now, for Mrs. Clinton — and you might even think of some better ones for Obama. “Mrs. Clinton, when did you first read the Steele dossier that you paid for?” “Mrs. Clinton, what was your reaction when you saw BuzzFeed actually publish the dossier despite their admission that it had not been verified or corroborated? Did you feel successful?” “As a former first lady, senator, and secretary of state, you are familiar with investigative reports from intelligence agencies. Were you fooled by the information in the Steele dossier? Did you believe what was in the Steele dossier? “Mrs. 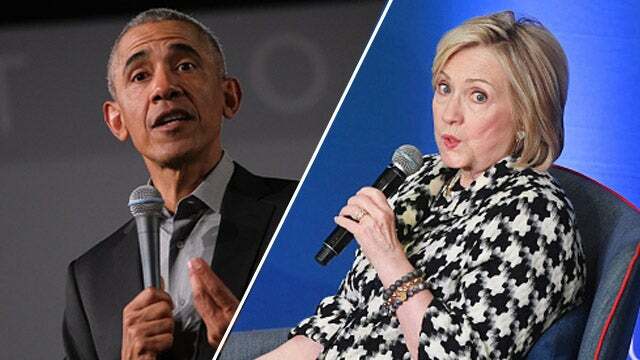 Clinton, are you at all worried that the Steele dossier can be tied to your campaign and that it was thus knowingly used to secure four fraudulent FISA warrants to spy on the Trump campaign, or did you feel like it was an eminently successful political operation?” I have to take a break. There are obviously a plethora of questions you could create. But the point is, there isn’t one ounce of curiosity from any reporter anywhere (in the Drive-By side of things) in any of this.